Submitted by witness on Sunday, June 29, 2014. OBSERVED: The reason I never told anyone was because I found it hard to believe myself, much less what other people would say or think about me. 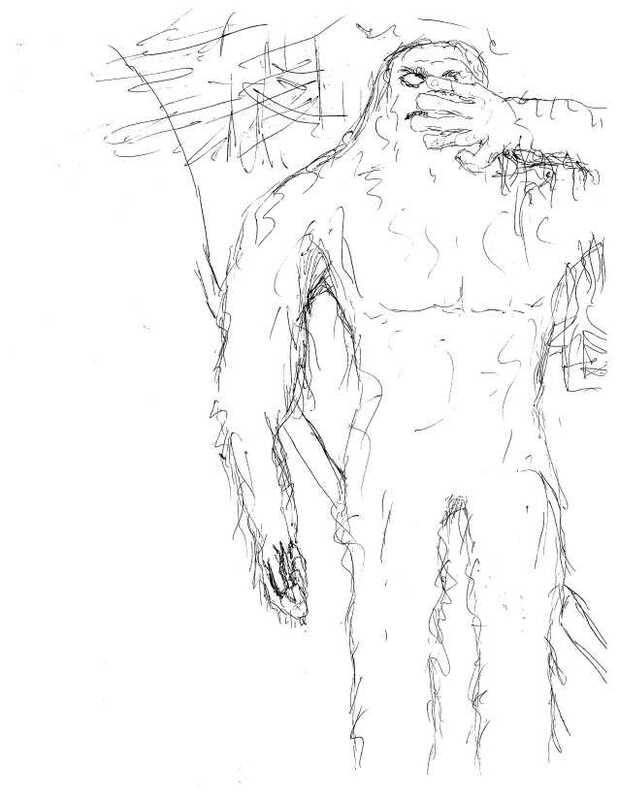 I recently began working at an ARMY hospital and befriended someone who had a very near experience with what was considered a juvenile Sasquatch. After 17 years that night is still very vivid and etched in my mind. With the help of Google earth maps I was able to find the exact spot that I had my encounter back in December 17, 1997. It was just as I had remembered and as I had described to my friend. The first time I saw it, again after all these years, the hair on my arms and neck stood on end and a cold chill ran through me. Amazing! After 17 years and never having told anyone I experienced that night over. It was December 17, 1997 my friend had wanted to take me to this spot that she said looked spectacular under a full moon. We reached the spot that had a clearing of deforested area to the right with a 45 degree grade. The road was cut against the mountain edge and it was a spectacular view with a fresh coating of snow that had fallen. The section of the road had a landing cut at the end of the curve and we had backed up into the landing where we could see any oncoming traffic. We had been there approximately an hour and the cab in my truck had gotten a little too cold so I turned on the truck and put the heater vent on. My friend had noticed something in the road when the windshield defrosted, we were staring at a full grown male boar that was rooting through the snow on the edge of the road. This thing was huge and it made me regret not having my rifle or bow with me. It was one of those chance of a lifetimes seeing something like that just 60 to 70 yards away. We were downwind from him and we must have watched that boar root for about 10 minutes when all of a sudden it sniffed the air and was gone. It ran like it feared for its life across the road and up the left side of the mountain that had the same 45 degree grade going uphill. My friend and I both wondered what would’ve made it run like that. I turned the truck off and we listened for any kind of noise that could have spooked him. We both talked about what would’ve made it run away like that. She joked that it was probably a black bear since they were common sightings out there. Maybe 5 minutes had passed when she peered out the windshield and pointed to the tree line and told me to look. She and I both thought it was a black bear and with the tree line in the background it was really hard to make out the shape. It wasn’t until it was approximately at the same spot the boar was and it was standing upright that I had to really strain to see what I thought I was seeing. We were still downwind from the spot where it was standing and had not noticed us yet. It was standing upright but it seemed it was looking at the ground as if tracking the boar. I watched it for a good 5 minutes and I tried to tell myself that everything in my mind was negating that it was not a black bear. First black bears do not stand and rear up unless provoked or if they need the height to look at something in the distance. Second, if it does stand up it does not walk a good 20 to 25 yards on two legs like this form did coming out of the tree line up a 45 degree slope. Third, when bears rear up on their hind legs their front arms and feet come towards the center of their mass and this form had long arms that swung at its side. As it stood over the spot where the boar had been rooting I was staring in disbelief. Mind you, my friend and I had not been drinking and neither one of us smokes, so there was nothing in our systems that could have created this image. There was a complete full moon but it was behind the form so all I could really see was the outline of it and I strained to see its face and form a little better. I reached to the left side of my dash and pulled on the light knob and then the high beams. There stood a figure approximately 8 to 8.5 feet tall. I could see the steam of its breath as it folded its left arm over its face and blocked my high beam light from its face. It stood there frozen as if he were trying to figure out what was causing this light. It looked puzzled and tried to see between its fingers at my truck but the lights must have really blinded it because it kept dodging its head back and forth to get a better look at us. We were at a stale mate; I was in disbelief at what I knew I was looking at and it was in disbelief at these two lights that were peering at him from the darkness. He tried to move to the side and the lights still bothered him because in an instant his face went from puzzlement to one of anger. I remember seeing his eyes. His eyes were this glowing amber red color and his brow was frowned which only intensified more the longer the lights shined upon him. He grunted and the steam from his mouth was a great billow of smoke caused from his hot breath hitting the cold midnight air. It looked like he was going to take steps toward the truck and I laid in on the horn. I remember his body shuddering at the noise and he turned towards the same general area the boar had run up. 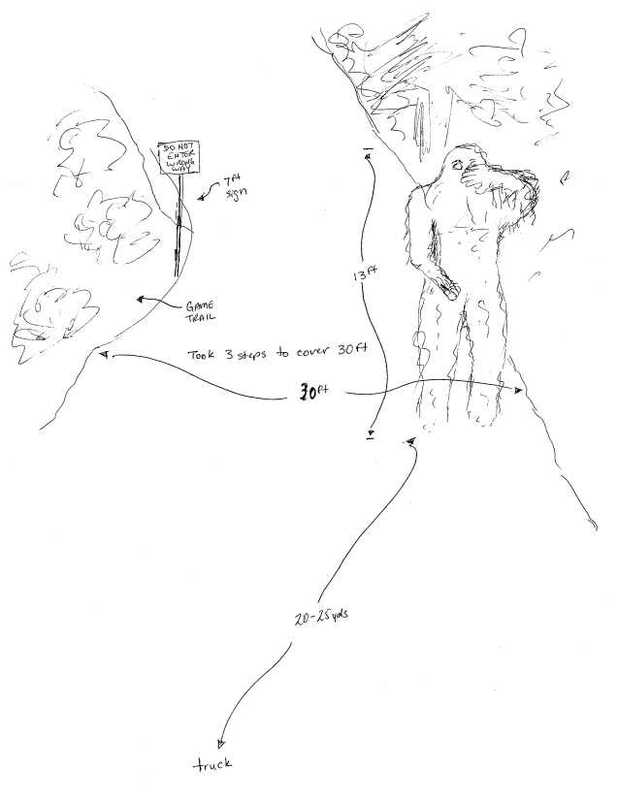 It took three strides for him to cover approximately 20 feet of road way and he reached up for the base of a small sapling grabbed it and propelled himself up the mountain and in a matter of 2 seconds he was gone from sight. I sat there almost in disbelief looking up the side of the mountain where he vanished. My heart was beating fast and I had these cold chills that scared me to the core. At this time I looked over at my friend and asked if she had just seen that. Her eyes were big as saucers, her mouth was open and shaking, and couldn’t make a noise. I reached over and touched her arm and she pulled it back hard. It was at this moment that I realized she had urinated in her jeans and she was afraid. Now let me tell you this girl was a mountain girl. Been hunting and fishing with her daddy since she was a little girl. She knew firearms, she knew how to hunt and fish and could hang with the best of them. She knew how to skin a dear, baited her own hooks, and cleaned her own fish. She knew how to rough it out in the wild and had been on hundreds of hunting and camping trips. This was by no means a girl that would scare easily. EVER! She never even looked at me she just screamed to get out of there and take her home. I tried reaching out to her and she pulled away. I knew her enough to know not to try further and I started the truck up. When the heater started up there was a stench that filled the truck cab. Something like strong urine and an odor of mixed sweat, and strong body odor. It was awful and made us both gag. I rolled down the window and the fresh air outside wasn’t any better. It took about a mile or two with the window rolled down to get that smell out. I drove up to her drive way and she got out without saying a word. Not a glance back or nothing. I drove home and didn’t sleep that night at all. The following day I grabbed my 30-06, my 9mm, hunting knife, some binoculars and headed back to the spot we had been at the previous night. I found the same spot but another dusting of snow had hidden any trace of the hog or the Sasquatch. I drove close to the road edge back and forth still kind of scared of exiting my truck. I eventually parked on the side of the road and traced the trail that the boar and Sasquatch had. My rifle in my hands with the safety off, my 9 at my side unclipped and with the safety off, and I was still uneasy. I walked back and forth and never found anything other than divots in the snow where he had walked and even though I took pictures when I developed them there was nothing conclusive. Thinking back now I failed to measure the distance from one divot to the other because there were easily 3 of my strides between snowed in divots. I did find the sapling that he had grabbed to catapult himself up the mountain and it was broken at the base but nothing there for me to collect. I must have sat in my truck for an hour or two still in disbelief. I finally cranked up my truck and swore I’d never say a word to anyone and to this date I never had until I met someone with an incredible story like mine. A little background on me. I am a Texas bred and born man. I have hunted, fished, and camped all my life. I have taken down big game in Mexico, Texas, New Mexico, Tennessee, and Florida. I know what foxes, coyotes, wolves, deer, elk, and full grown bears look like. I am a former United States Marine, Desert Storm War Era veteran. I’m the kind of man that would tell people I could walk up to the devil, spit in his eye and ask him for a light. I am not a glory seeker as I could have been telling this story for years but have never done so prior meeting this gentleman at work. He asked me to sit down and draw what I saw and it was with amazing accuracy that I was able to draw everything I saw that night including the eyes. The eyes burned and glowed in the night like two red hot coals peering from behind this massive hand. I’ll never forget that look of those eyes. OTHER WITNESSES: Yes. One. Cannot come forward due to being married. OTHER STORIES: I heard of one such incidence from a co-worker who had a near like experience in North Carolina. He's the one who told me about this site. His story is posted on here. TIME AND CONDITIONS: past midnight, full moon, snow covered mountain, clear skies no snow falling. I spoke with this witness for an extended amount of time along with an on site follow up of the area. I find this man to be very credible. He was very well spoken and highly detailed throughout the interview. The following details can be added to the original report. The sighting location is within the north central region of the Great Smoky Mountains National Park. It is a small one way road that winds for several miles through an extremely remote and mountainous area of old growth forest. It contains an abundance of caves, rivers, creeks and food sources. I would consider this area to be a prime location for supporting large wildlife. Upon visiting the sighting location I found the description of the area to be very accurate. While inspecting the roadway where the animal was said to have crossed, I noticed a small game trail that came up the hill, crossed the road and continued up the mountain side into the forest. At one point during the evening I did experience a very strong urine odor similar to the description in the original report. I have since conducted multiple night time visits to this area encountering possible wood knocks and bipedal footsteps within the surrounding forest. I am continuing to investigate this area on a regular basis. Growing up in central Mississippi, Greg's main interest have always centered around the outdoors. He has an extensive background in camping, hiking and wildlife observation. After relocating to East Tennessee in 2010, Greg became greatly involved in wildlife research within the Great Smoky Mountain National Park and continues ongoing research projects. Currently a facility engineering tech in East Tennessee. Has attended BFRO expeditions in North Carolina, Colorado, Georgia and multiple private expeditions throughout the southeast.